Size: 12½ x 10½ in. While it is clear that artist Robert Bissell (American, b. England 1952) derives his inspiration from the animal world, his paintings are not simply portraits of bears, rabbits, and other creatures. They are allegories for the challenges and discoveries all living beings encounter on life’s journey. 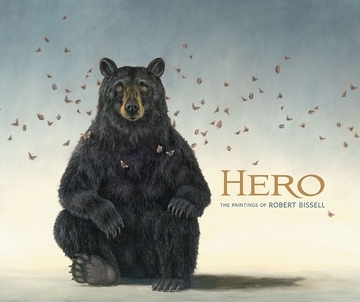 Hero: The Paintings of Robert Bissell is organized according to the construct of Campbell’s hero’s journey. Each of the 10 chapters—from “Genesis” and “Vision” through “Crossing” and “Initiation” to “Return” and “Elixir”—presents paintings that interpret these archetypal experiences. Bissell’s grand and detailed landscapes provide Edenic stages for each scene in the journey. Carl Little’s introduction offers biographical background and explores Bissell’s process, motivations, and revelations, and the artist has supplied brief stories for many of the paintings. The path of human experience is joyfully recounted in Hero, illuminated by Bissell’s animals, who invite our contemplation as they mirror our own quests, conundrums, and resolutions. Although the English-born Bissell started out surrounded by animals on his childhood farm, he did not start out a painter. After studying photography at the Royal College of Art in London and later moving to America, he spent a decade in the corporate world before starting his own catalog company. Soon, however, he decided to follow his heart and create art full-time. He lives in the San Francisco Bay Area and regularly exhibits in museums and galleries across the United States and Europe. Carl Little is the author of many books, including Edward Hopper's New England and Winslow Homer and the Sea. He is a regular contributor to art magazines and has contributed essays to a number of museum and gallery exhibition catalogues. Formerly the director of the Blum Gallery at the College of the Atlantic, Little lives with his family in Somesville, Maine.